Mystery Ducks in Kerrville Park. These exotic ducks were photographed in Kerrville's Flatrock Park. Normally, Ken and Yvonne are the people we go to for bird identification, but in this case they are stumped. Update: The Rudine Team answers their own question. 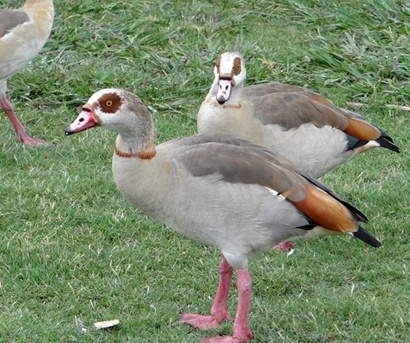 “It's a cross between a goose and a duck called a Shelduck.! The flock we saw must have had thirty or so and they were all along the banks of the Guadalupe. 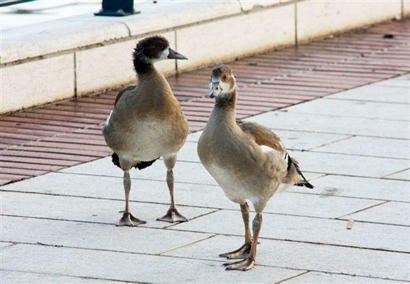 We followed Ken’s suggestion and found much more – including this photo of immature ducks provided by David Ben Dov. Colonies are spreading out from their native habitat and in England they have been declared a pest.